The launch of Fenty Beauty was a thing to behold. 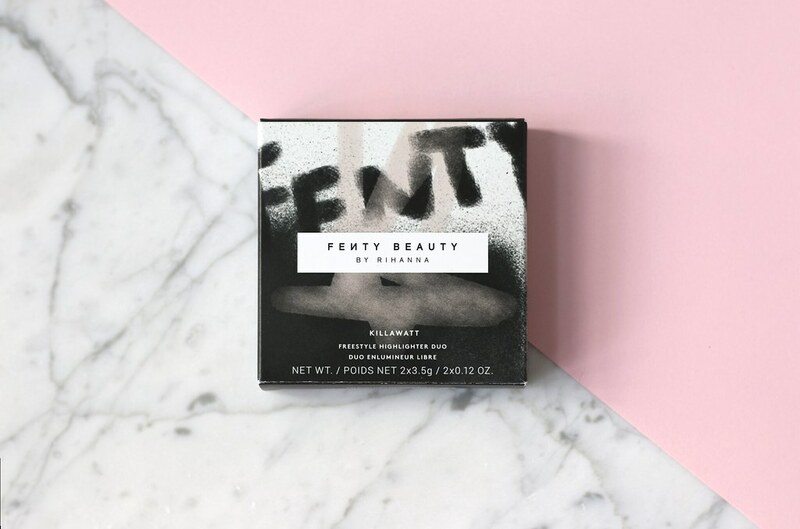 Days before the whole internet was peppered with Fenty Beauty’s Instagram photos and everywhere there was speculation about what was going to be in the collection. I can’t say that I was immune to any of it as everything that Rihanna touches turns into gold. I dissected ever photo, looked everywhere to see if anyone had an inside scoop and set my alarm in time for the European launch. Once the collection launched, I was on the Harvey Nicols website to look for something in the line that would take my liking. I was incredibly impressed (like everyone else) by the range of foundation colours, the cool highlighter sticks (purple anyone?) and the powder highlighters and before I knew it I had loaded up my virtual shopping bag. After that I had to reign myself in: I reminded myself I usually don’t use cream highlighter and that it would probably be better to match a foundation to my skin colour in person. 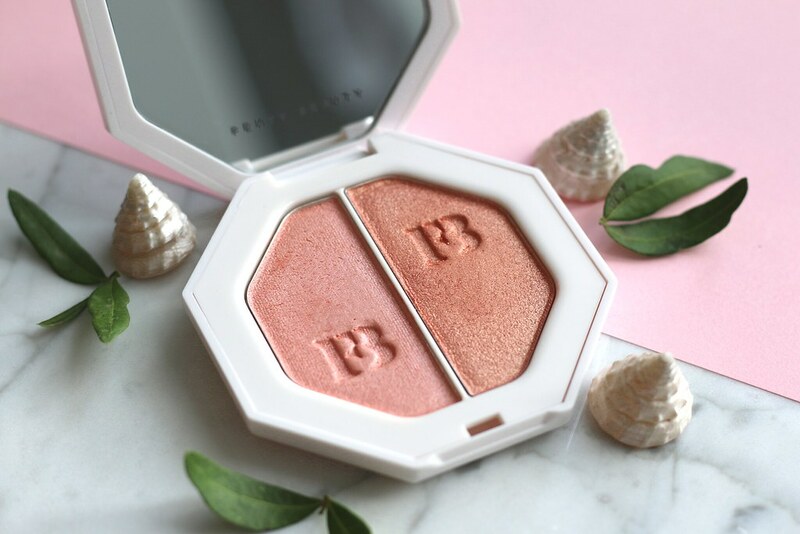 I ended up buying only one thing, the thing I (like everyone else) was most excited for, a powder highlighter. I choose a split pan Killawatt Highlighter, because it made me feel I was buying two things for the price of one. The one I picked out came with the colours ‘Girl Next Door’ and ‘Chic Phreak’, a soft rosy pink and a shimmery peachy pink. I was over the moon when it arrived. The box it came in was a bit more tough and busy than what I had expected after seeing the sleek and simple geometric packaging all over the internet, but I like how it’s very much ‘Rihanna’: cool, tough and sophisticated all rolled into one. Inside the box was a white, shimmery octagon compact. Opening the compact (which can be a little difficult) you find two pink highlighters and a nice-sized mirror. ‘Girl Next Door’ is a soft pink with less glitter than ‘Chic Phreak’, a darker pink shade. They both are beautiful, but when applied they are a little bit more glittery and a little less shiny or pink than the pictures and photos had me believe. The glitter is very fine and mostly visible in low light or direct sunlight. As the highlighters are both pink I have tried using them as a sort of ‘blush topper’. I have quite a round face and, as Wayne Goss explains in this video, round face shapes take well to blush that is applied like a c-shape from the temple to the cheekbone. The highlighter, he explains, goes on top of the blush, focusing only on the high points of that area. 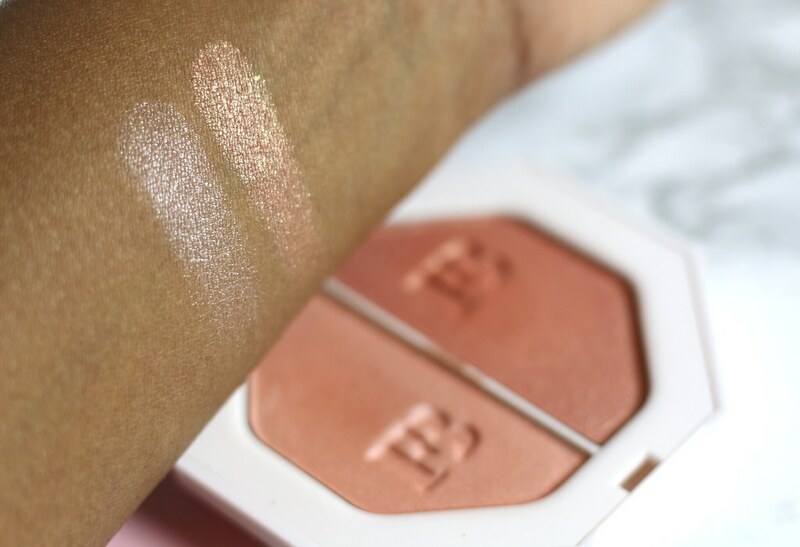 I think these highlighters are perfect for this technique, as they blend nicely in to the blush below and give your face a (less outlined) little pop of simmer and shine. The only issue I have with them, is that they don’t translate as pink on my skin as I thought they would. ‘Girl Next Door’ is a beautiful colour for an everyday make up look as it’s not too shimmery, but I feel it’s a little bit too pearly on my cheeks. ‘Chic Phreak’ does look more pink but has a lot more glitter in it, which makes it harder to use for me. Lastly, I’ve been trying out the highlighters as eyeshadow. I really like the subtle shimmer and consistency, but (again) for some strange reason neither highlighter looks pink when applied on my eyes. ‘Girl Next Door’ looks pearly on my eyes and ‘Chic Phreak’ looks more like a champagne colour on my eyes. All in all, I like the Killaway Highlighter from Fenty Beauty, I just wish the pink colour translated a bit better on my skin tone.